Butterflies are some of nature’s most eye-catching creatures, considered by many throughout history as signs of joy and love. 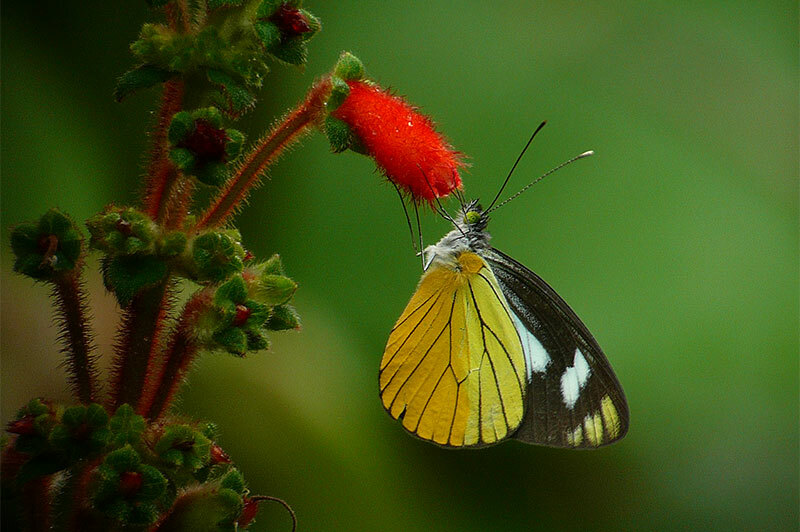 In the neotropical region of the Americas, the diversity of butterflies is incredibly high; an estimated 1,800 species can be found in Panama alone. Our Canopy Family Butterfly list has nearly 1,000 species! Butterflies are active year-round; however, they rely heavily on their host plants, and their activity can be quite seasonal, with more flight and visibility in the wetter months (April to December) of the year. 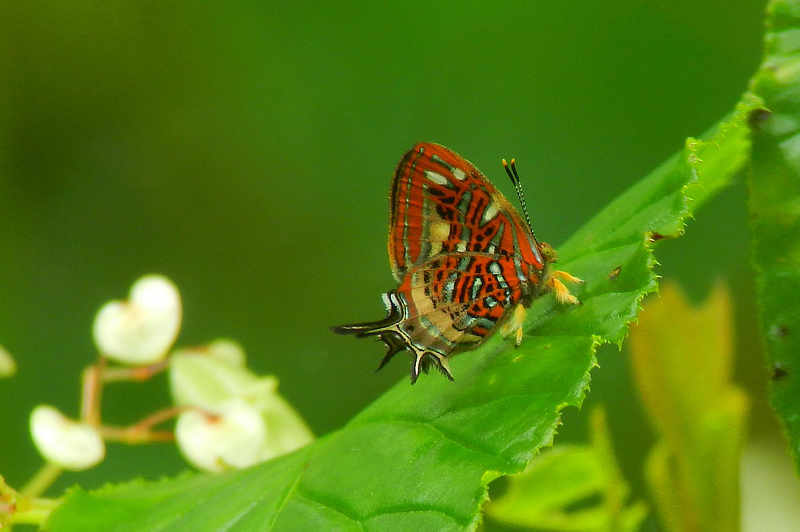 Come join the expert Canopy Family butterfly guide(s) as we explore the lowlands of the Canal Area and the mist-laden foothills of central Panama in search of butterflies! 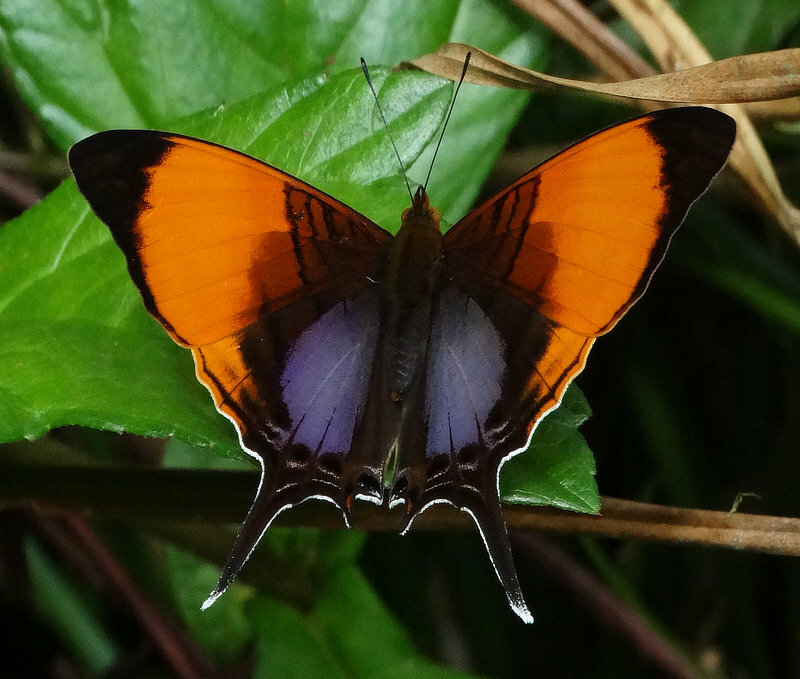 Butterflies are the main focus of this tour, as we will find and identify as many species as possible. An average of 250 butterfly species are seen. While searching for butterflies we will also see birds, mammals, reptiles and other insects. Though we won’t concentrate on these, we will certainly ID as many as possible. Butterflies will be identified near, far and in-between, so bring camera and binoculars! The guides will have a spotting scope that can also be used for digiscoping (with your phone) for images of the more obliging species! A light and sheet will be used to attract moths, katydids, mantids and other insects to enjoy and photograph, but be aware that we will not be able to ID most of these. 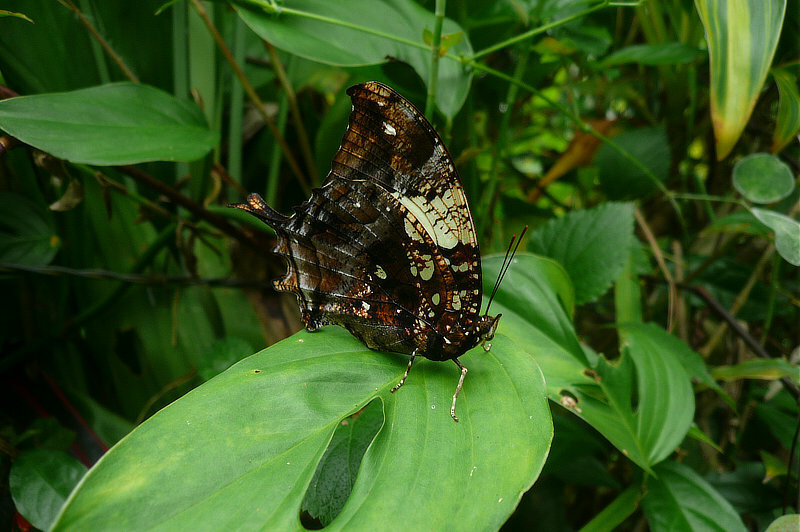 This tour may be combined with Butterflies of Canopy Camp Darien tour for the ultimate Panama butterfly experience! Rate is US$ per person (+ taxes), double occupancy. 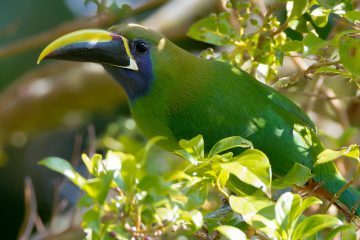 This all-inclusive tour includes lodging and meals at the Canopy Lodge and Canopy Tower (and Canopy Camp for the extension), bilingual professional guides, WiFi, wine with dinner, airport transfers to and from Panama City and all tours as per the itinerary. Please check with our reservations office for the times of our scheduled airport transfers to coordinate your arrival and departure times. This tour does not include flights to and from Panama City, all taxes, private airport transfers, tips and alcoholic beverages. This tour is limited to 12 participants. To book this special nature package, please contact us. Spaces are limited so book your spot now! This tour will be led by Canopy Lodge guide Tino Sanchez and Canopy Family biologist Linda Harrison. Tino has been photographing and learning the butterflies around the Canopy Family lodges for several years now. His knowledge and love for butterflies is obvious. Linda had studied butterflies in Florida for 20 years prior to moving permanently to Panama in 2011. Since then, she has feverishly been learning the butterflies of Panama – along with the plants associated – and, with Tino, are perfect complements to each other in the field. 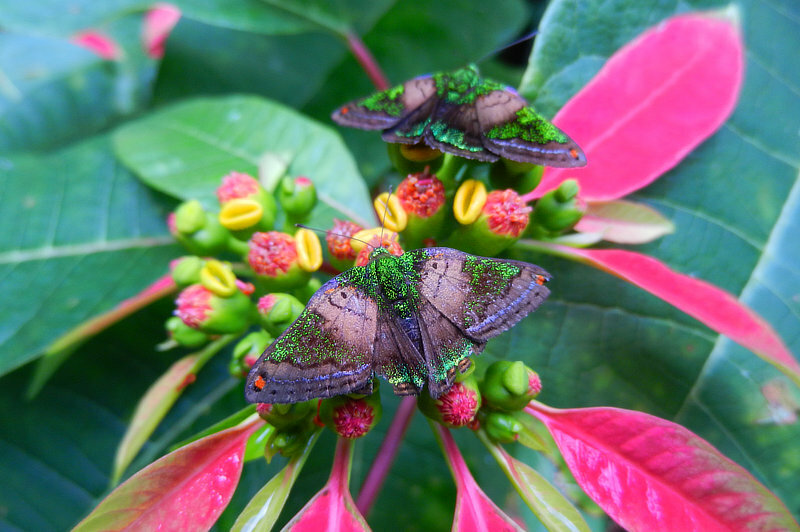 Tino and Linda look forward to sharing the butterflies of Panama with you! Welcome to Panama! You will be met at Tocumen International Airport (or your hotel if you arrive the day before) by our driver and transported 2 hours west of Panama City, to the foothills of central Panama to El Valle de Anton. 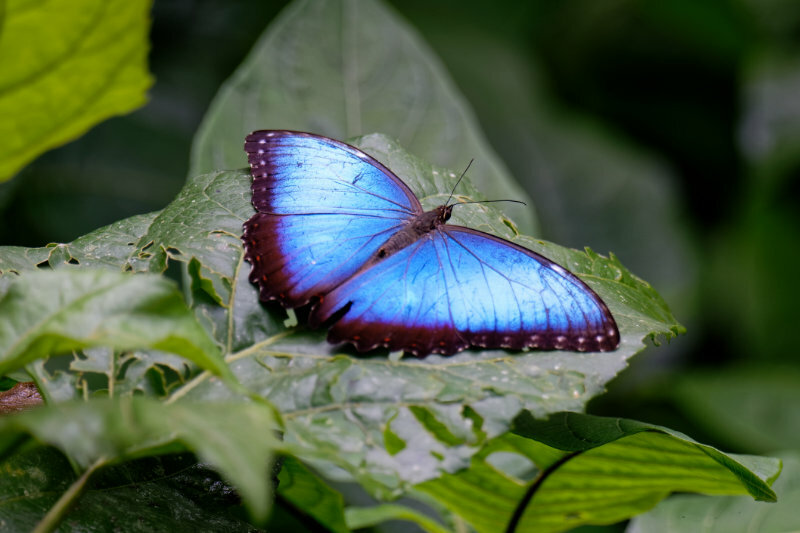 After you get settled into your rooms at the Canopy Lodge, nestled against a cloud forest backdrop, we will head to the lodge gardens and check butterfly-friendly flowers and plants including verbena, lantana, and firebush. True Cattleheart, Cattleheart White, Mottled Scrub-Hairstreak, Lampeto Metalmark, Common Morpho, Dirce Beauty, Banner Metalmark, One-spotted Prepona, Iphiclus Sister, White Satyr, Malachite, Eligius Flat, Falcate Skipper, Golden-snouted Sootywing and Radiant Skipper can be found around the garden and surrounding areas. We bait for butterflies by placing a fermenting blend of bananas to attract morphos, owl-butterflies, satyrs, preponas and beauties. If time permits, we will take a stroll down the road beside the lodge, as the abundant open area roadside vegetation and forest edge attract a wide variety of species including Thoas Swallowtail, Apricot Sulphur, Black-bellied Anteros, Yellow-tufted Prepona, Starry Cracker, Zebra, Erato and Sara longwings, Rayed Sister, Blue-and-orange Eighty-Eight, Simple Patch, Narva Checkerspot, Banded Peacock, Orange Daggerwing, Stub-tailed Morpho, Green Flasher and Rita’s Remella. We will return to the lodge before dusk, to freshen up for dinner. Before dinner (every night) we will do the day’s checklist and go over the plans for the upcoming day. LUNCH & DINNER AT CANOPY LODGE. After dark, we will turn on the UV light in hopes to attract some nocturnal insects! There are far more species of moths than butterflies in the Neotropics, and although they present challenges to species identification, we will hope to see species in several families of moths, including some large sphinx moths and silk moths! 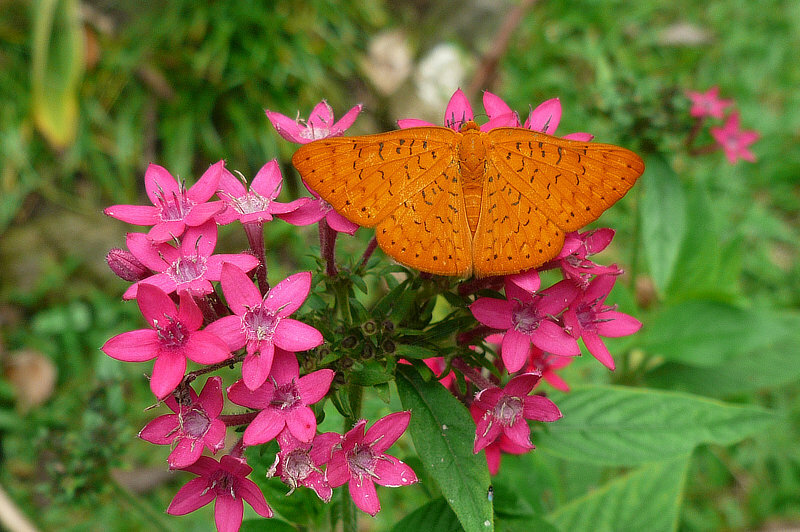 Please note that our butterfly tours focus on the identification of diurnal lepidopterans (butterflies and skippers). We will enjoy the moths on the light sheet but there will be no attention to their identification. Awake as the morning light hits the windows of your room. The morning chorus of birds starts at dawn, and the garden feeders attract colorful tanagers, euphonias and hummingbirds. As we enjoy a hearty breakfast in the open-air dining area, the day continues to warm up and the first butterflies become active. 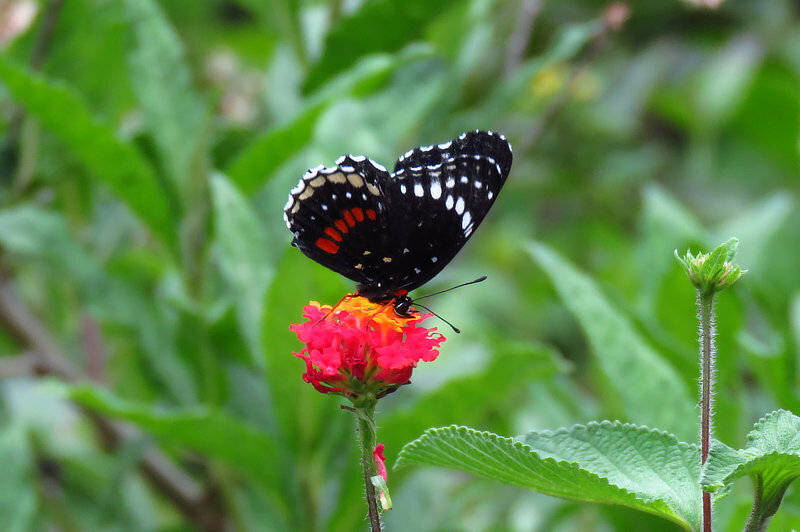 We will make a quick check along the creek for the first butterflies of the morning before we head to our morning destination—Las Minas Road. This dirt road, used mainly for foot travel, extends through tropical scrubland and low canopy forest. It is a haven for butterflies! We will slowly walk the road and scan the roadsides for swallowtails, hairstreaks, brushfoots and skippers, which are particularly abundant here. Simple Sarota, several metalmarks, Tutia and Diasia clearwings, Lycaste Tigerwing, East-Mexican Banner, Black-bordered Crescent, Isidora Leafwing, Sara, Sapho and Fine-lined longwings, Hermes and Rufous-margined satyrs, Pasture, Trailside and Pompeius skippers and many more can be found along this road. This area can be so active with butterflies that we barely make it a few hundred meters down the road! If time permits, we will also visit the area of La Mesa and Finca Macarena. Forest, field, scrubby pastures and gravel roads provide excellent habitat for a great diversity of butterflies. 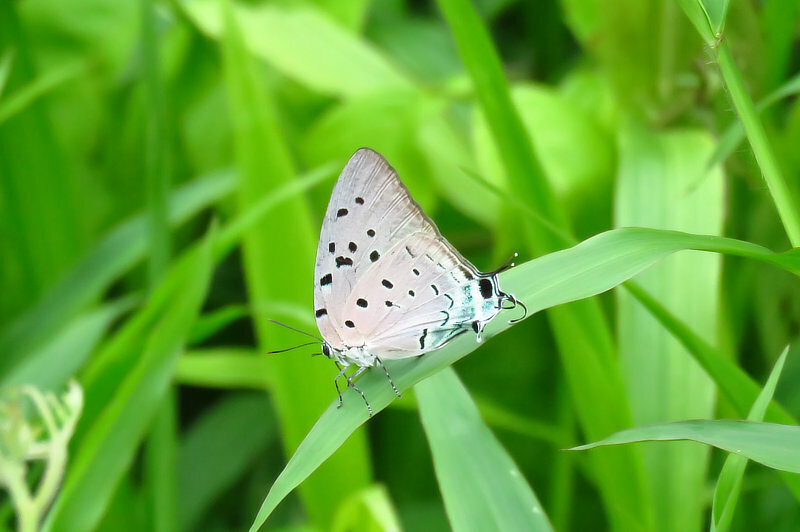 Here we will look for the tiny yet stunning metalmarks, including Panamanian and Godman’s sarotas and Deep-blue Eyed-Metalmark. LUNCH AT CANOPY LODGE. After lunch and a short rest (which most of us will use to look for butterflies around the Canopy Lodge gardens! ), we are off to Valle Chiquito! We head out of El Valle and start our way down the slope of the ancient volcano; we descend a steep road into a valley, adorned with ferns and broadleaf trees. At a slightly lower elevation, we hope to see some different species here! The roadside vegetation is perfect butterfly habitat. Aquamarine and Phaleros hairstreaks, Zebra Longwing, Thamyra Satyr and Panna Skipper are common here. We will check under broad leaves for the stunning Pixie! As the heat of the day passes and the butterflies settle in to their forest roosts for the night, we will head back to the lodge where there will be plenty of time to freshen up before our checklist and dinner. As dusk approaches, we will watch for the crepuscular species—Pale and Scalloped owl-butterflies–which may be active around the gardens. DINNER AT CANOPY LODGE. After an energizing breakfast, we will make our way uphill to Cerro Gaital—the steep, forested, mist-shrouded mountain that you can see from the lodge. Cerro Gaital (3,500’) is the namesake of Cerro Gaital Natural Monument, which protects more than 335 hectares of mature cloud forest in the foothills of central Panama. After disembarking from the van, we will slowly explore the first short forest trail, where even in the morning mist, we may see Dark and Banded Owl-Butterflies as they seek out their daytime roosts. 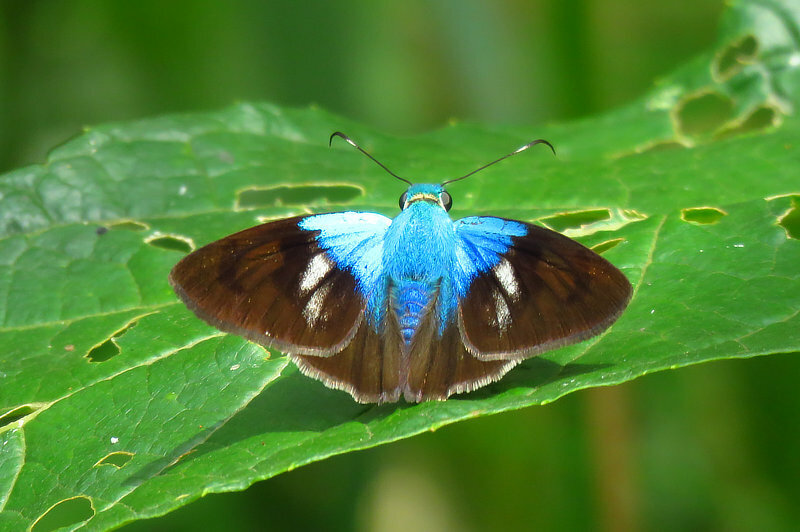 Mimosa Yellow, Clearwinged Mimic-White, Blue-patched Eyed-Metalmark, Tiger Mimic-Queen and Blue-gray Satyr can be seen flying low in the cloud forest understory. We will reach a clearing and a small wetland, where a great variety of butterflies can sometimes be found, particularly hairstreaks, metalmarks and skippers—Cattleheart White, Togarna and Fine-lined hairstreaks, Golden and Bright-centered euselasias, Azure-winged Eurybia, Lasus Metalmark, Westwood’s and Thamyra satyrs, Red-headed Firetip and Trailside Skipper can be found here. As mid-day approaches, we will return to the lodge for lunch. LUNCH AT CANOPY LODGE. In early afternoon, we will head to Cara Iguana. Here, a seldom-travelled paved road provides a perfect means to butterfly the weedy, forest edges. We will scan the edges searching for skippers, metalmarks, and hairstreaks among others, always keeping a watchful eye out for crackers and daggerwings! As the sun lowers and the butterfly activity quiets for the day we will head back to the Lodge. DINNER AT CANOPY LODGE. Today is an exciting day—after an early breakfast, we head to the Pacific Lowlands to Juan Hombron and Santa Clara. We will drive to the west of El Valle and down towards the coast, stopping at any spots along the way that look promising for butterflies. Our first “planned” stop with be the road to Juan Hombron where we will check the forest and pasture edges for skippers, metalmarks, hairstreaks and tigerwings. After checking the roadsides, we head to Santa Clara and a beach house where we will enjoy our picnic lunch while watching the waves come ashore. The road in front of the beach house is bordered by forest and fields and offers excellent habitat for butterflies. After our day of butterflying in the lowlands we had back to El Valle. This afternoon is a good opportunity for us to visit the ever-popular El Valle artisan market in the center of town. It is a great place to find hand-made Panamanian products and souvenirs. As the last of the sun’s rays fade for the day, we will enjoy a lovely evening, reviewing today’s butterflies with appetizers before dinner. DINNER AT CANOPY LODGE. 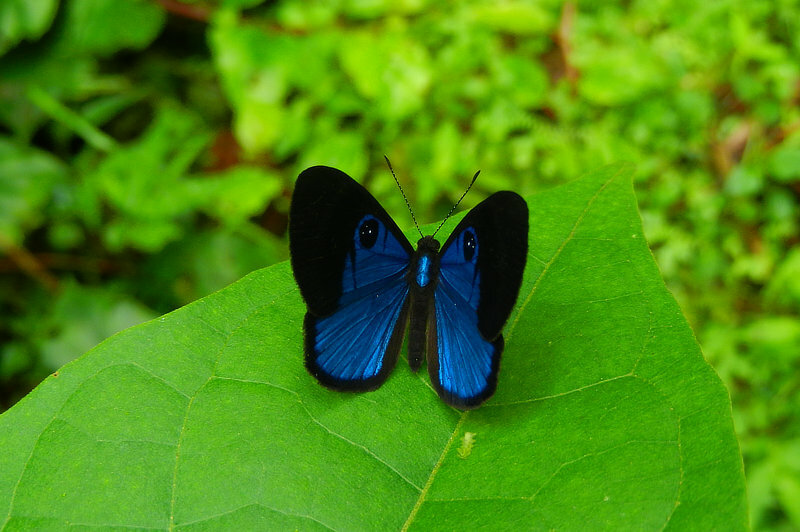 This morning, we will have some time to explore the gardens of the Canopy Lodge one more time for butterflies, as there is always something interesting to see! At mid-morning we will say goodbye to the foothills of El Valle de Anton, as we head towards the lowlands of central Panama, to the unique Canopy Tower, located in Soberania National Park. The Canopy Tower was a US Air Force radar station built in 1965, now fully renovated and repurposed as a nature observatory and eco-lodge in the heart of the rainforest! 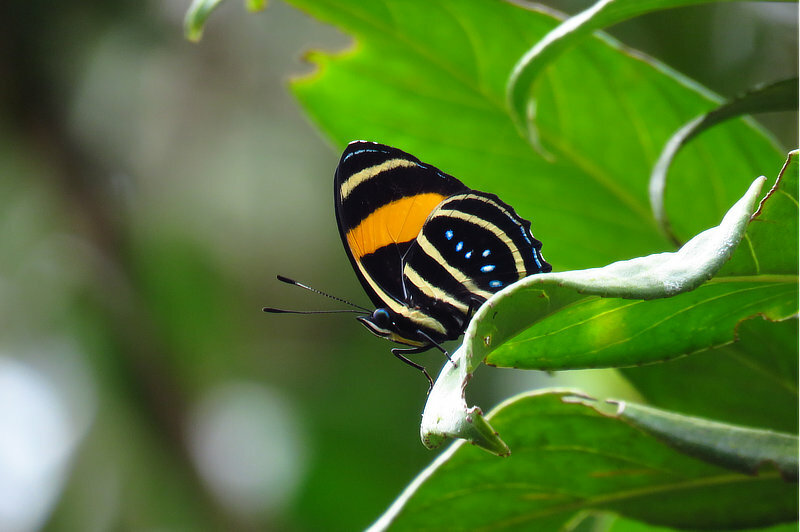 The 50-foot high observation deck puts you in the canopy providing the opportunity to view many canopy butterfly species at eye level, many of which are very difficult to see from the ground. Upon arrival at the Canopy Tower, you will be shown to your room and, after a brief orientation, enjoy lunch in the canopy-level dining room. 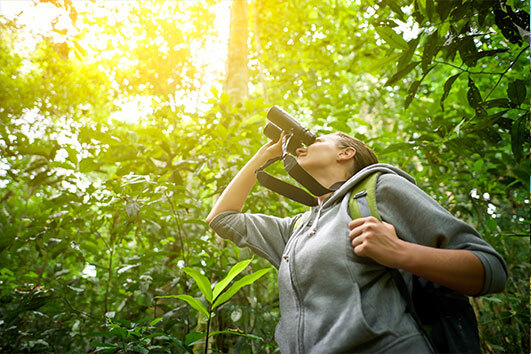 Make sure you bring your binoculars and camera to lunch—often there are monkeys, sloths, iguanas and toucans right outside the dining room windows, not to mention BUTTERFLIES! LUNCH AT CANOPY TOWER. This afternoon we will take advantage of the great observation deck and take our first glances at some incredible canopy butterfly species! Possibilities include Thoas and Androgeus swallowtails, kite-swallowtails, Malachite, Dusky-blue Groundstreak, Amyntor Greenstreak, Spying Hairstreak, the eye-catching Mexican and Imperial arcas, Tricolored Metalmark, Blue-based and Curve-lined theopes, White-spotted, Three-toned and Two-spotted preponas, Dia Leafwing, Molpe and White-posted metalmarks, Two-eyed Eighty-Eight, Red-striped Leafwing, Orion Cecropian, Double-banded Banner, Banded Orange, Julia, Spot-celled and Iphicleola sisters, Many-banded Daggerwing, Cramer’s Satyr, the spectacular Regal Hairstreak, Costa-spotted Metalmark and White-tipped Cycadian! 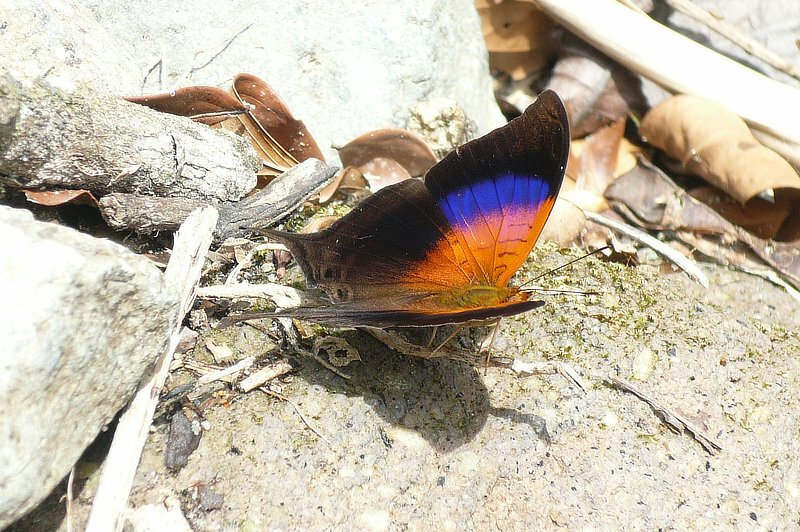 Many species of skippers can be seen from the tower, both up in the canopy and down at ground level, feeding at the verbena. 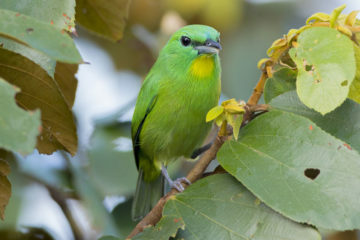 We will hope to see Dot-collared Firetip, White-tailed Longtail, Gilbert’s Flasher, Corbulo Skipper, Broteas and Canal scarlet-eyes, Dyson’s Silverpatch and White-trailed Skipper. After an afternoon of exploring all levels of the canopy for butterflies, we will meet to review our checklist for the day and relax before dinner. DINNER AT CANOPY TOWER. Just like at the lodge, we will turn on the UV light at night for moths and nocturnal insects. You can check it throughout the evening and see what’s still on the sheet in the morning! Before heading out for Metropolitan Natural Park in Panama City this morning, it is a good idea to see what butterflies can be found in the windows of the Canopy Tower, as some of the crepuscular butterflies enter the tower during dawn and dusk and sit on the windows around the dining room. Common Phanus, Split-banded and Narrow-banded owl-butterflies, Tricolored Metalmark, White-patched Emesis, White-posted Metalmark and Cramer’s Satyr often find themselves inside the Tower, a great opportunity to see these butterflies up close! 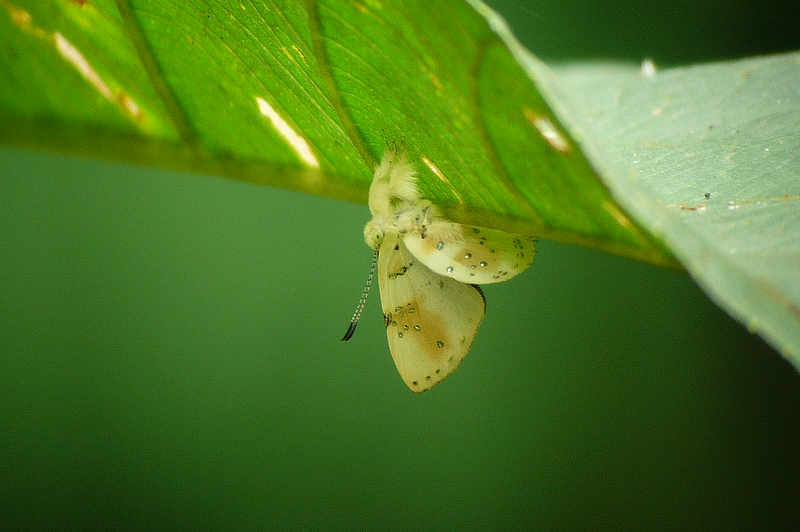 The drier forests and open areas of Metro Park offer species like Tiger Mimic-Queen, Hermes Satyr, Tropical Buckeye, Erato Longwing, Emerald-patched Cattleheart, Great White Longtail, Stigma Skipper, Uzza and Thamyra satyrs, Polydamas Swallowtail, Blue-gray Satyr, Lasus Metalmark, Statira Sulphur, Panna Skipper, Tropical Checkered-Skipper, Whitened Crescent and Brown, Plain and Great White longtails are just some of the butterflies we will look for today. The park offers a variety of habitats to explore, so our list here could be extensive! We will head back to the Tower for lunch. LUNCH AT CANOPY TOWER. This afternoon we are off to Old Gamboa Road! This is the original road that extended to Gamboa; once a passageway for traffic, now it is a wide footpath, grown over by tall grasses bordering open areas and surrounded by patches of forest and wetlands. It is a great place to search for Dimorphic Skipper, Golden White, Togarna Hairstreak, Molina and Lucianus metalmarks, Green, Hecale and Melpomene longwings, Whitened and Orange-patched crescents, Banded and White peacocks, Stub-tailed Morpho, Golden-snouted Sootywing, Two-eyed Eighty-Eight, Dusky Owl-Butterfly, Polymnia Tigerwing, Hermes and Plain satyrs, Great White Longtail, Trailside Skipper and much more. After a grand afternoon of butterflying, we will return to the tower in time to freshen up for dinner. DINNER AT CANOPY TOWER. After a satisfying breakfast at the Canopy Tower, we can scan the canopy one final time for any butterflies we have missed and those we enjoy seeing daily, before saying “adios” and heading to the airport to catch our return flights home. The tour officially ends after breakfast. Please note that the itinerary is flexible, and may change without prior notice due to weather, alterations in habitat or other conditions. The Canopy Tower is located in impressive rainforest atop Semaphore Hill within Soberanía National Park, 35 miles north of Panamá City in the Republic of Panamá right in the center of the New World— and just 2½ hours from Miami! 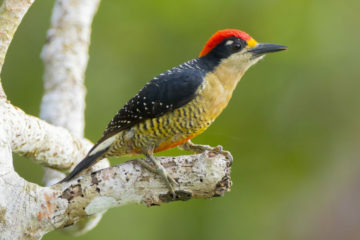 It’s one of best locations for birding lodges in Panama.